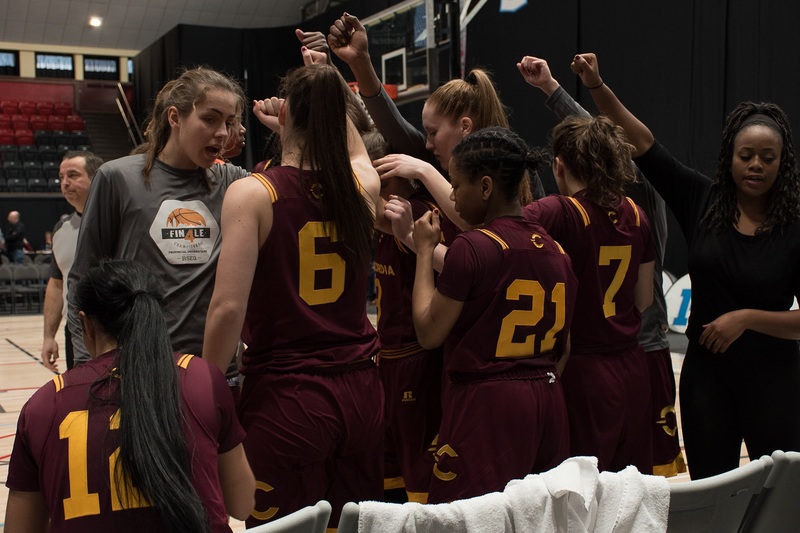 Even though the Concordia Stingers women’s basketball team suffered a crushing loss against the McGill Martlets in the finals of the conference championships this season, the team is on the rise. After finishing with a 7-9 record during the regular season, the Stingers upset the third-ranked team in the country—the Laval Rouge et Or—in the semi-finals of the playoffs. Just to compare, the Stingers were ousted in their first playoff game last season. The team improved on offence and defence this season, but the team was plagued by injuries to key players throughout the season. Rookie Ashley Moss went down with an achilles tendon injury at the beginning of the year, and then rookie Marvia Dean went down with a torn ACL. Veteran Aurelie d’Anjou Drouin also missed significant time due to a high ankle sprain, while guard Jazlin Barker played a few games with a fractured thumb. This was truly a banged up squad towards the end of the season, and one might question what they could have been had the team not suffered all those injuries. Nonetheless, the program has seen a few players emerge who are going to contribute in a big way next season. Barker is one of those young players who progressed as the season went on. “I’m happy with the way she played for us, down the stretch,” Gittens said. Gittens added that Barker’s play got better as the season went on, since she was adjusting to the pace of U SPORTS basketball at the start of the season. One of the major contributors this year was rookie guard Caroline Task. She was honoured by U SPORTS with a place on the all-rookie team after averaging 9.1 points per game and finishing fifth in the conference with 1.7 steals per game. Gittens praised Task, saying that she and Barker add versatility to the team. With the addition of Dean and Moss, the team has a solid foundation going forward. This is good news for a team that is losing veterans Marilyse Roy-Viau and Richelle Grégoire next season. Gittens said the focus is now on recruiting a new class of players who will fit in with the group already in place. The team will take a break, but soon enough, will be back in the gym to prepare for the upcoming season. With the team about to embark on an intensive offseason, just as key players return from injuries, Gittens concluded that the team is going to be “alright” moving forward.